Well its been a long time since I wrote anything on my blog. It’s a lot harder to keep up with the little bits of writing and photos when you have a full time job. but try to keep it up I must – especially with my impending north American adventure just about to start and the opportunities that will bring for random things to write about – well I’m hoping so anyway. 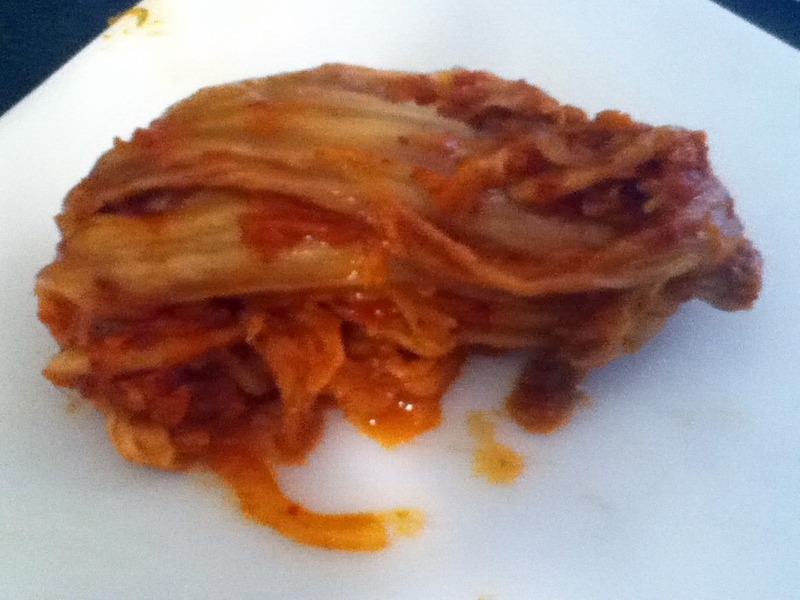 So with this new found verve I’ve decided to tell you about my adventure in Kimchee creation. 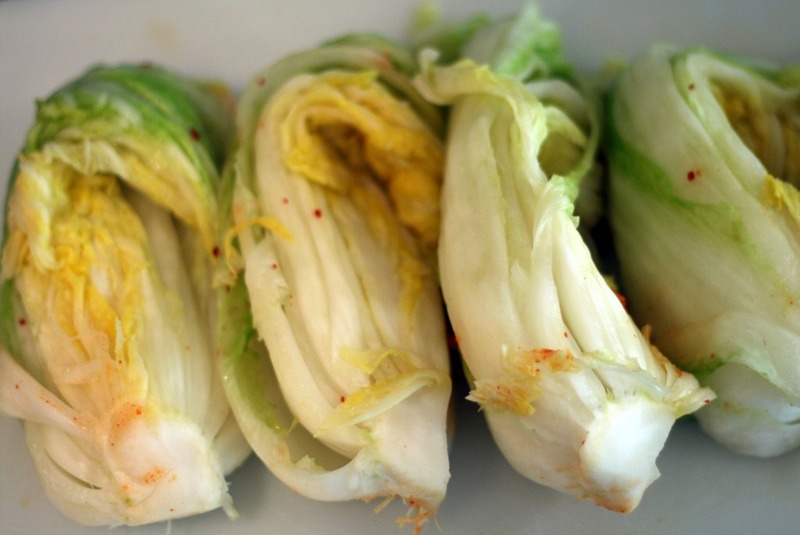 I have to say I’ve a little passion for this spicy salted cabbage, not quite the three times a day passion that most Koreans do, but a little. i really like it, and being here in Vancouver with its large Korean population i thought i should give it a go. 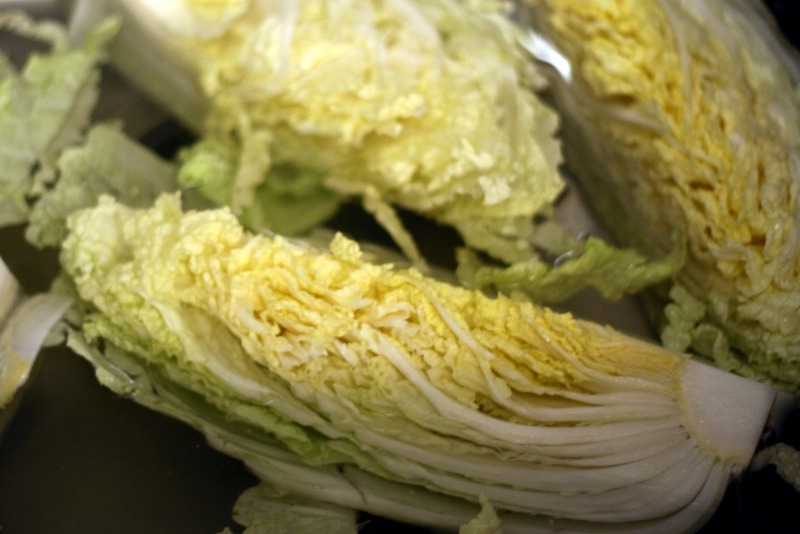 So Napa cabbage in hand (Chinese cabbage in the UK), and under the instruction of my Korean friend a co-worker and Kimchee mentor, Issac Ko (or Lee Sakk Ggo!! ), I began. As with cured/pickled/salted things the end product is really influenced by the quality of the ingredients, so hoping that they were going to be the best I popped down to the Korean supermarket to get my ingredients – 2 large Napa cabbage, rock salt, 2 apples, 2 Asian pears, 2 onions, 4 whole garlic bulbs, a Korean daikon and a 1kg bag – a lot of chilli I know. 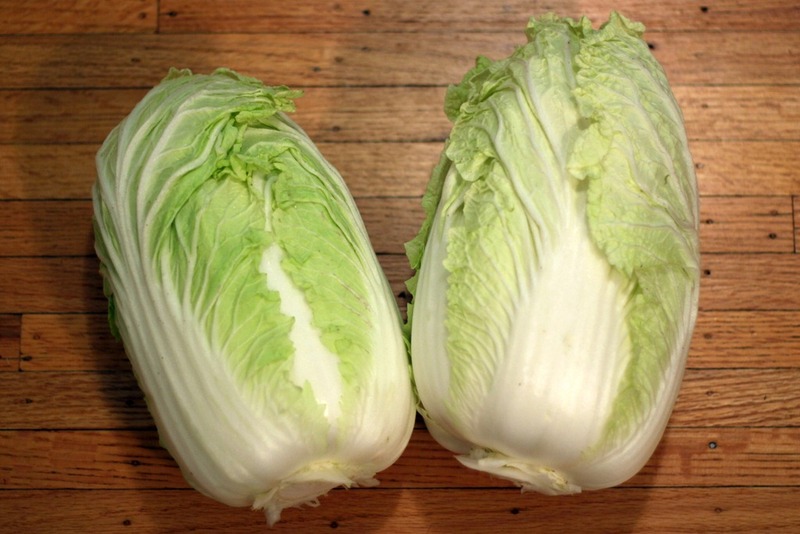 First step is to cut, wash and salt the cabbage. its important to really give the cabbage a good clean to get rid of anything that might impair the flavour. I cut the cabbage into 1/4 pieces and soaked for 10 minutes. Next i shook it off and gave it a good coating of rock salt, weighted the top of it with some plates, and left it for 4 hours, till it became soft and kind of a bit rubbery. While the cabbage was salting I made the spice mix. Pears, apples, onion, garlic, I grated together and mixed with loads of chilli, some fish sauce, and a little sesame oil – pretty straight forward really. I just tasted this and decided when I liked it pretty much. Next I rinsed the salt off the cabbage and began to coat the cabbage leaf by leaf until it was covered. i placed this in a large cupboard and waited for 2 days for bubbles to appear, the tell tale sign that fermentation has started. After this its ready to eat. It needs to be refrigerated to stop the fermentation and keeps for about a month after that. 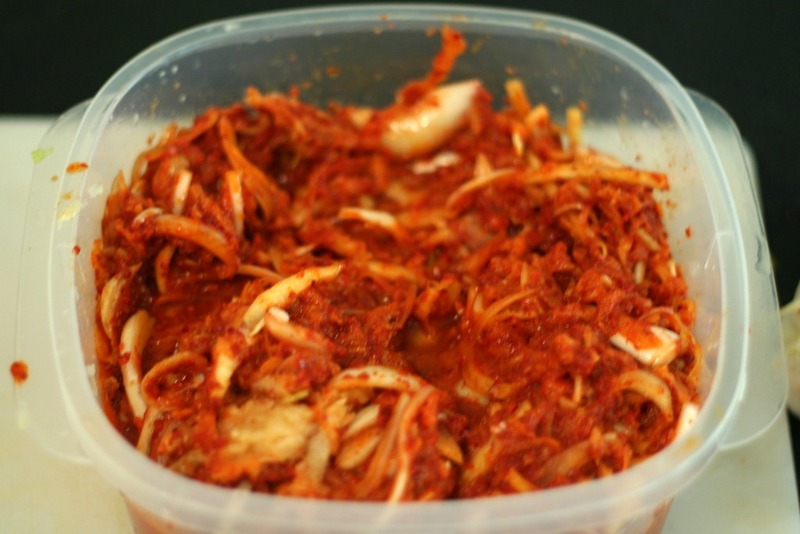 Eat it as a side, add it to noodle soup, add it to stews – its really handy to have in the fridge, adds a spicy edge to any meal – and its super healthy. Give it a go – or buy it at an Asian supermarket – but remember no self respecting Korean would ever do that! !